2018 Meet the Candidates! Open Forum will be moderated by Robert Hruska, Grocery Manager of Fareway in Stewartville. The official time keeper will be Jared Johnson, Manager at Anytime Fitness in Stewartville. 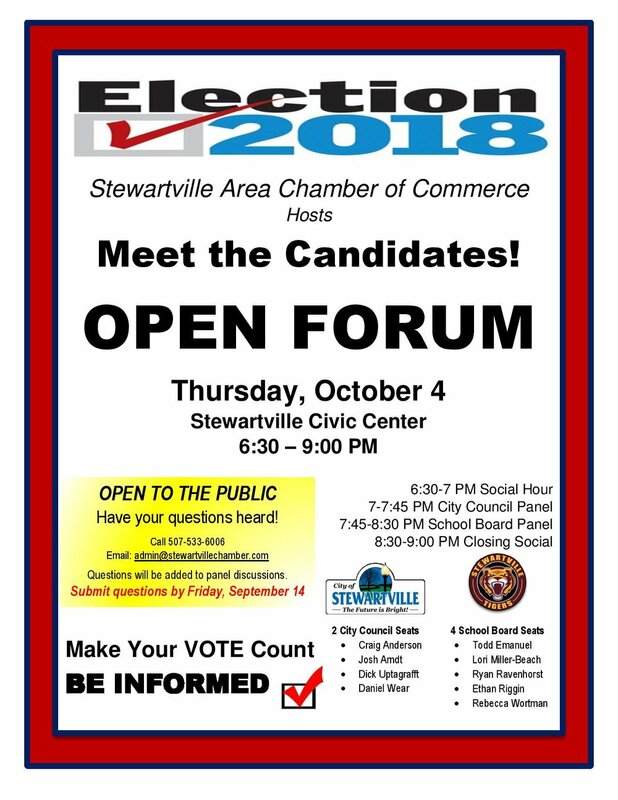 Post Forum: If you would like to learn more about the candidates for Stewartville City Council and Stewartville School Board, please see the links below to the candidates who have provided their short answers from the Public Forum held on October 4, 2018. Click on the candidate’s name to link to their responses, highlighted names are the candidates who have submitted their responses for review. The Stewartville Area Chamber of Commerce hosts election forums every two years on even numbered years. The forums typically have panel discussions involving all candidates running for local government and school seats. Candidates running for county and state seats are invited to attend to answer questions during the opening and ending social hours. Election forums are open to the public. The panel of candidates are moderated with previewed questions. There will be an open mic opportunity for the public to ask questions to each panel of candidates. Candidates are allowed one minute or less to answer a question.